The number of children who are overweight is growing at epidemic proportions, according to the Center for Disease Control. The percentage of school-aged kids who are overweight more than tripled from 1974 to 2004, and many of those kids become overweight or obese adults. Inactive lifestyles, reliance on fast food and junk foods, and larger portion sizes have played a major role in leading kids to becoming at risk for weight-related illnesses, many of which are potentially deadly: high blood pressure, heart disease, and diabetes. Yet at the same time, eating disorders such as anorexia and bulimia are also on the rise, and ninety percent of those affected are adolescents and teens. The challenge for parents is daunting—how to encourage their kids to keep themselves at a healthy weight while not crossing the line into eating disorder. Add to that the difficulty of understanding kids’ weight—maybe the recent weight gain is just the precursor to a growth spurt; maybe the weight that’s beyond normal range is affecting the child’s social life, and school performance, and possibly mental health. These are issues understood all too well by Dr. Bartell, who is a psychologist, former overweight teen, and mother of three. In her latest book, she explores the challenge of extra weight based on her own experience, that of the parents and kids in her psychology practice, and recommendations and insight from a Parent Advisory Panel. Like a good mom, she offers reassurance and a calm, friendly approach to this delicate topic. The book is highly approachable, with each chapter broken into small sections including quizzes, bullet lists, and examples from real life. Bartell stays away from medical jargon and never loses the friendly, blame-free voice. 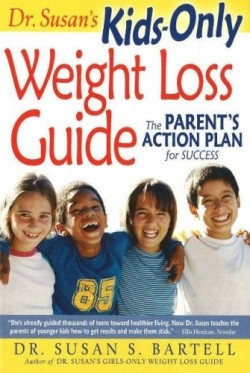 Each chapter offers solutions and practical ideas, including how to stock a fridge and what language to use when talking to a child (the word “diet” is not recommended). It’s a tough subject, but one which is handled admirably.